The dsp.MedianFilter System object™ computes the moving median of the input signal along each channel, independently over time. The object uses the sliding window method to compute the moving median. In this method, a window of specified length is moved over each channel, sample by sample, and the object computes the median of the data in the window. For more details, see Algorithms. Create the dsp.MedianFilter object and set its properties. medFilt = dsp.MedianFilter returns a median filter object, medFilt, using the default properties. medFilt = dsp.MedianFilter(Len) sets the WindowLength property to Len. medFilt = dsp.MedianFilter(Name,Value) specifies the WindowLength property using a Name,Value pair. y = medFilt(x) computes the moving median of the input signal, x, using the sliding window method. Data input, specified as a vector or a matrix. If x is a matrix, each column is treated as an independent channel. The moving median is computed along each channel. The object accepts multichannel inputs, that is, m-by-n size inputs, where m ≥ 1, and n > 1. m is the number of samples in each frame (or channel), and n is the number of channels. The object also accepts variable-size inputs. Once the object is locked, you can change the size of each input channel, but you cannot change the number of channels. Filtered signal, returned as a vector or a matrix. The size and data type of the output matches the size and data type of the input. Filter high-frequency noise from a noisy sine wave signal using a median filter. Compare the performance of the median filter with an averaging filter. 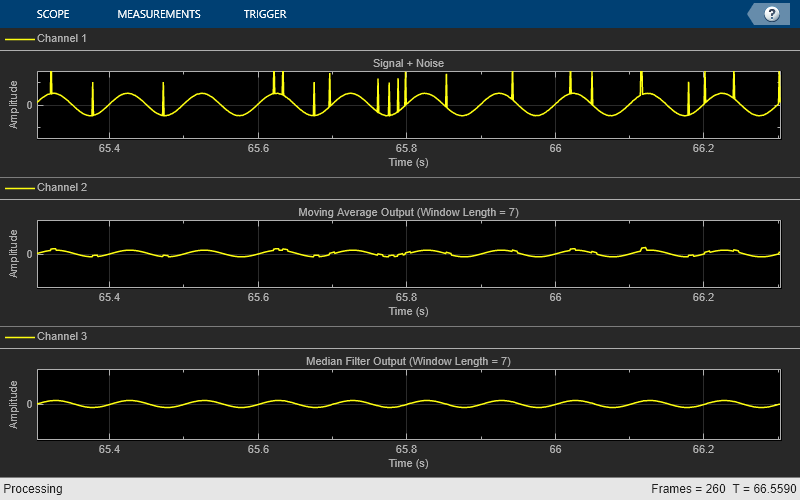 Set up a dsp.MedianFilter object, medFilt, and a dsp.MovingAverage object, movavgWin. These objects use the sliding window method with a window length of 7. Create a time scope for viewing the output. Generate a noisy sine wave signal with a frequency of 10 Hz. Apply the median filter and the moving average object to the signal. View the output on the time scope. The median filter removes the high-frequency noise more effectively than the moving average object does. This example shows how to remove the high-frequency outliers from a streaming signal using the dsp.MedianFilter System object?. Use the dsp.MatFileReader System object to read the gyroscope MAT file. The gyroscope MAT file contains 3 columns of data, with each column containing 7140 samples. The three columns represent the X-axis, Y-axis, and Z-axis data from the gyroscope motion sensor. Choose a frame size of 714 samples so that each column of the data contains 10 frames. 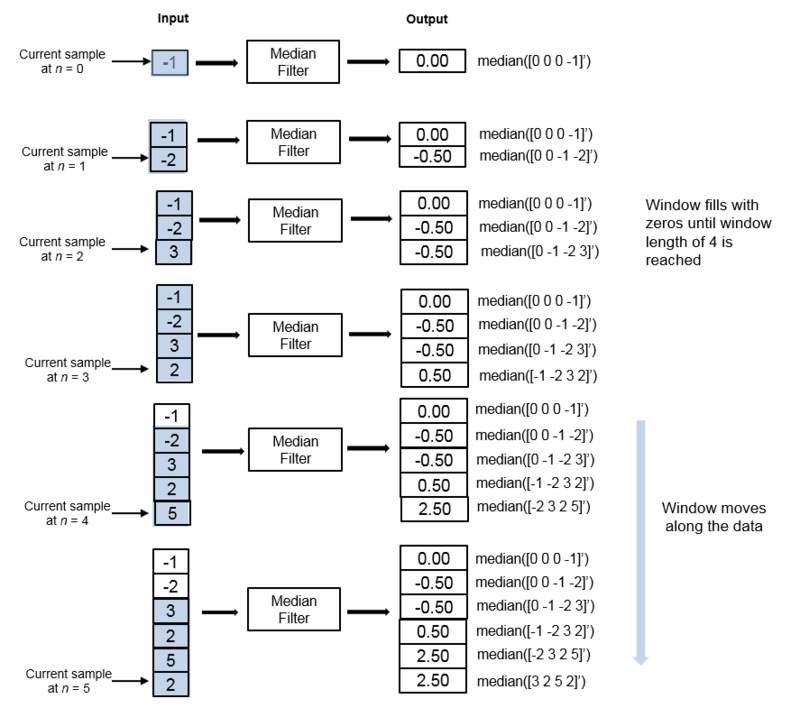 The dsp.MedianFilter System object uses a window length of 10. Create a dsp.TimeScope object to view the filtered output. Filter the gyroscope data using the dsp.MedianFilter System object. 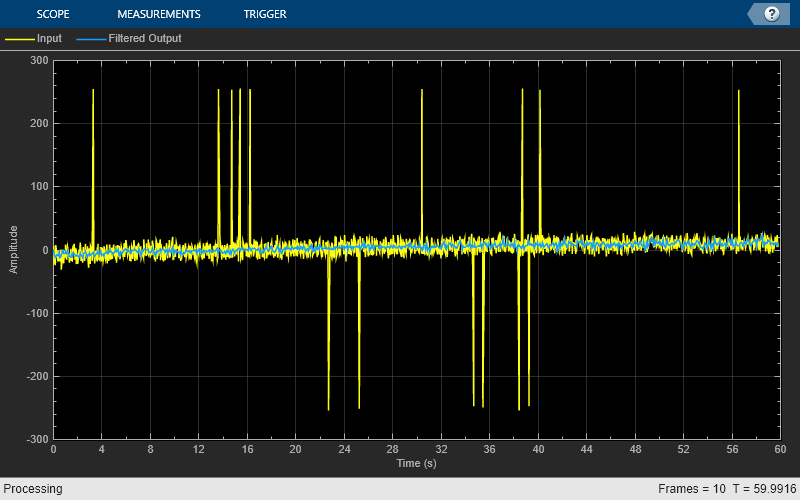 View the filtered Z-axis data in the time scope. The original data contains several outliers. Zoom in on the data to confirm that the median filter removes all the outliers. In the sliding window method, the output for each input sample is the median of the current sample and the Len - 1 previous samples. Len is the length of the window. To compute the first Len - 1 outputs, when the window does not have enough data yet, the algorithm fills the window with zeros. As an example, to compute the median value when the second input sample comes in, the algorithm fills the window with Len - 2 zeros. The data vector, x, is then the two data samples followed by Len - 2 zeros. This object performs median filtering on the input data over time. Consider an example of computing the moving median of a streaming input data using the sliding window method. The algorithm uses a window length of 4. With each input sample that comes in, the window of length 4 moves along the data. This object supports C and C++ code generation.